I’m sure you already know salmon is really good for you! That’s not really new news, but if you are like us, while you know salmon is good for you, you might sometimes feel like you need new ways to enjoy it. 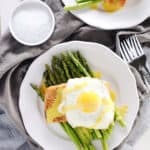 We are always looking for new salmon recipes and new ways to make it. 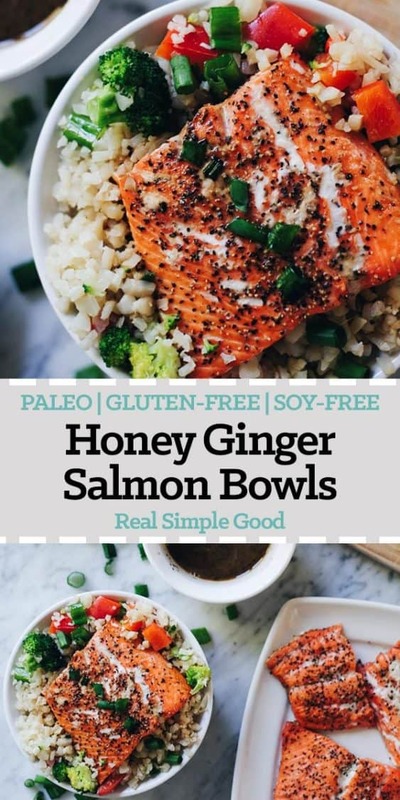 These honey ginger salmon bowls are not only a tasty way to enjoy salmon, but also quick and easy to make! 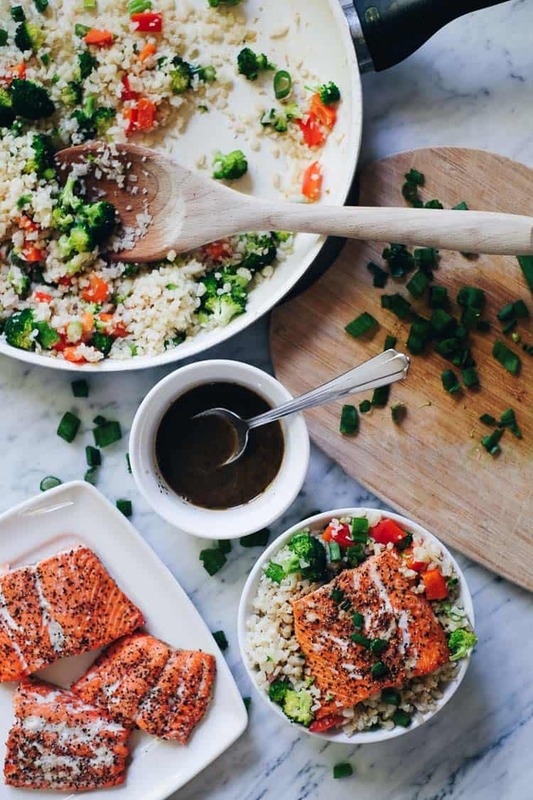 We love these honey ginger salmon bowls because there is really nothing fancy about them. Yep, that’s right, simple and easy to execute pretty much always wins in our house. 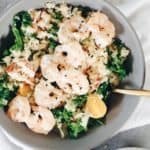 Don’t you just want to make something that’s good for you and also super easy sometimes (or all the time)? 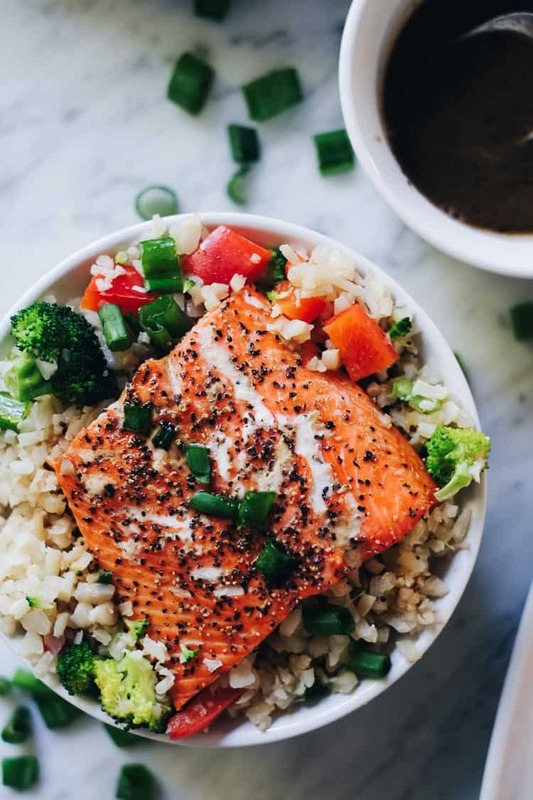 For these honey ginger salmon bowls, we just bake the salmon and season it with sea salt and pepper. The rest of the ingredients are just veggies and an uncomplicated sauce. Throw it all together in a bowl, because duh bowls are life, and call it good! 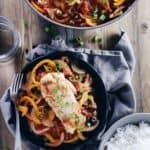 You will get the health benefits of salmon along with plenty of veggies and a tasty sauce. We always mean to eat more salmon, but honestly sometimes it just sounds so boring. It’s SOOOO good for you though. It’s all the good stuff wrapped up in one superfood. You get plenty of protein, healthy fats, selenium, B vitamins, vitamin D and more. Plus, it is great for promoting reduced inflammation and overall brain health. There are plenty of posts and articles out there, but this one from Dr. Axe sums it up nicely. We love making sauces and marinades at home! I used to be intimidated at the thought of making my own sauce, dressing or marinade. Luckily, Justin is a wizard when it comes to these things, and he’s taught me so much and helped me gain confidence. Now, I would rather make my own sauce than use a store bought one. 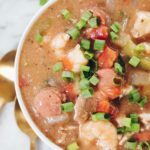 I love how easy it is to tweak the flavors to just what you want, and you can also control the ingredients and make sure it is made with only real food ingredients. The best part though is that adding a simple sauce can add that extra flavor punch that really makes a dish. 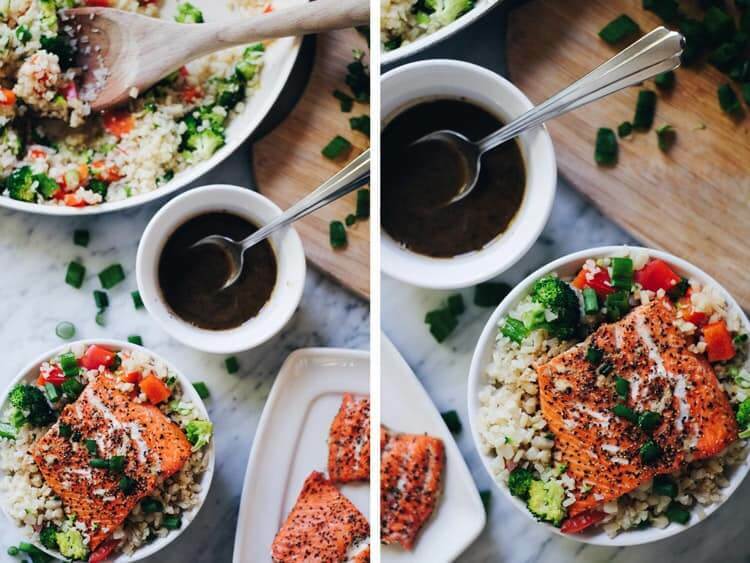 That is exactly what the simple sauce for these honey ginger salmon bowls does! Also, check out our post with 5 Homemade Marinades for other sauce ideas. 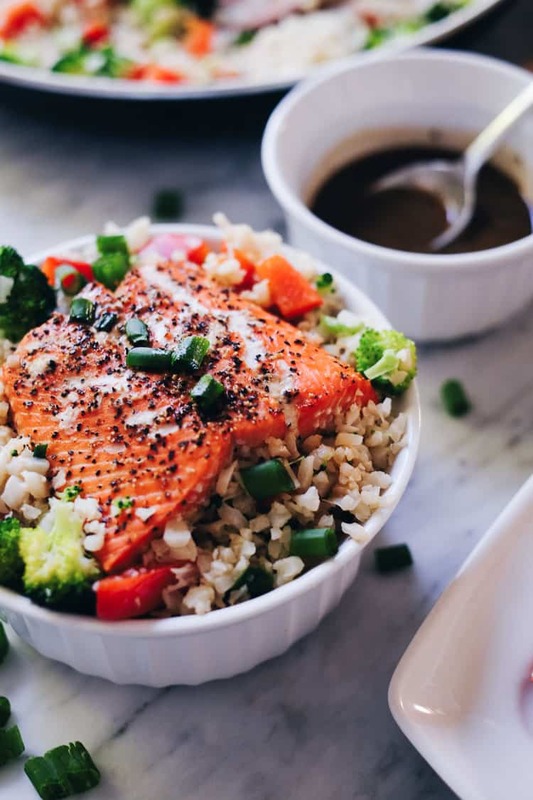 Add a little more salmon into your life with these honey ginger salmon bowls. 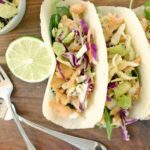 You’ll love the fresh flavors and and enjoy the simple and quick preparation. Let us know how it goes by leaving a comment below. Also, take a photo and tag us on Instagram @realsimplegood, so we can check it out! 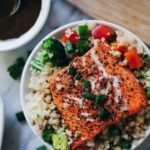 These honey ginger salmon bowls are not only a tasty way to enjoy salmon, but also quick and easy to make! Preheat oven to 400° Fahrenheit, line a baking sheet with parchment paper. Make sauce by whisking all sauce ingredients in a bowl or jar. Set aside. Place salmon fillets on baking sheet and season liberally with salt and pepper. Place in the oven to bake for 15-20 until flaky with a fork. Cooking time will vary depending on the size of your fillets. While the salmon is baking, prep cauliflower, broccoli, bell pepper and green onion as noted. When the salmon has about 5 minutes left, place oil and all of the veggies (except reserve half the green onion for a garnish) in a large skillet over medium heat. Cook stirring occasionally until salmon is done. Season with salt and pepper, to taste. Once salmon is done, remove from oven and make bowls. 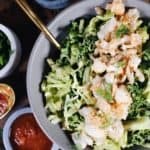 Start with a couple scoops of the veggie mixture, add salmon, drizzle sauce over everything and top with sesame seeds and the remaining green onion. Enjoy!